If you want to start the year with positive vibes, don’t miss to watch Comedy Jamboree at Grand Country Music Hall located at W 76 Country Blvd. Branson, MO. Comedy Jamboree are some of the best Branson shows where you can feel the positivity and laugh your hearts out. This #2 best seller comedy show in Branson features slap-stick antics of Applejack and Guppy McGee, as well as the jamming country music of Todd Bradshaw. This matinee show is full of hilarious comedy, dancing, and a variety of musical numbers appropriate for the whole family. The entertaining performances that you can see on this show offer an interactive experience to audiences, so don’t be surprised if Applejack pulls you onstage to participate in his humorous antics. Country singer Todd Bradshaw titillates audiences with several different numbers, and Tracy Heaston warms the heart and soul of audience members with his flawless piano techniques. As you get hooked with this fantastic show, you will enjoy its floor-pounding clogging routines, hilarious costumes, and even more ridiculous stage props that make this production worth seeing. The members of the cast are extremely welcoming and take pleasure in talking with guests before and after the show. With heavy participation on the show from audience members, Comedy Jamboree is sure to give fun and excitement for every member of the family. Winner of “Branson’s Best Comedy Show”, Comedy Jamboree is sure not to be missed by those who want to enjoy amazing comedy and musical extravaganza. 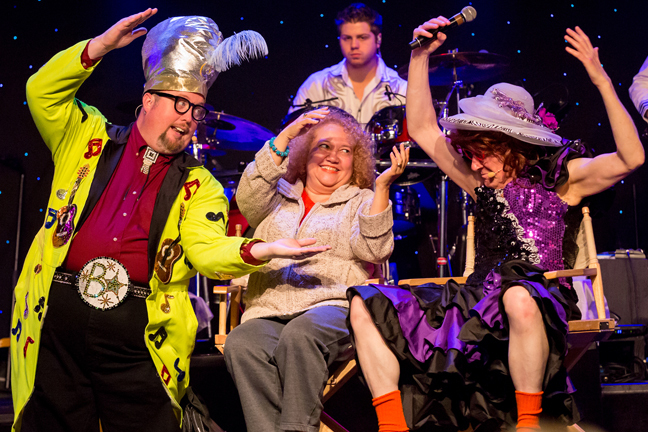 This entertaining two-hour variety show is famous for family-friendly fun show in the Ozarks. Featuring some of the funniest comedians in Branson, Comedy Jamboree is sure to make you laugh over and over again. Some members of the family in the audience can have the opportunity to participate on stage. There are times that the guests steal the show. The Jamboree singers will rock you with kickin’ music, great talents and showmanship. From hilarious, clean comedy and floor-pounding dancing, to today’s country hits and gospel songs, Comedy Jamboree is a hot show. For a fantastic afternoon show, the Comedy Jamboree is a must see. This comedy show will make you move to the edge of your seat. You will laugh until you feel the tears of joy. An electrifying extravaganza of music and mayhem, Comedy Jamboree is a show like no other that has everything. With a complete cast of lovable and incredible comedic characters and talented musical artists, this is the high-spirited, clean-humored show that you’re looking for to bring your whole family to see. Performers of the show include zany comedians Applejack, Stretch McCord, Harley Worthit, and Adam and accompanied by the Jamboree Singers, the Grand Band, and genius pianist, Tracy Heaston. Comedy Jamboree is a fantastic Branson show that will inspire you to let go of your reserve and laugh over and over, dance and sing in the aisles, and wish the fun would never end. So bring the whole family and head to Branson – straight to the phenomenal Comedy Jamboree.